drives the most difficult loads, including headphones. With it's small size and low power drain, the Audio Upgrades Mic Pre Card can fit almost anywhere, offering "high speed" sound at an affordable price. Installation is easy, requiring only six connections. 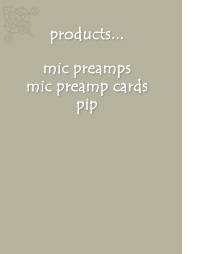 The preamp is ideal for critical music recording as well as demanding film and post work. Gain is adjustable from 12 to 60 db. Double sided unplated circuit board. WIMA polypropylene and Panasonic electrolytic capacitors. Precision Roederstein Resista 50 ppm metal film resistors. High Speed Video Amp is socketed for future upgrades. Size = 1.25 X 2". Frequency Response 2 to 200k Hz. Equivalent Input Noise = -129.5 db with 150 ohm input. Slew Rate= 3000 volts per microsecond. Common Mode Rejection= -80 db typical. Phase Shift= Less than 10 degrees at 20k Hz. Output current drive > 50 milliamps.